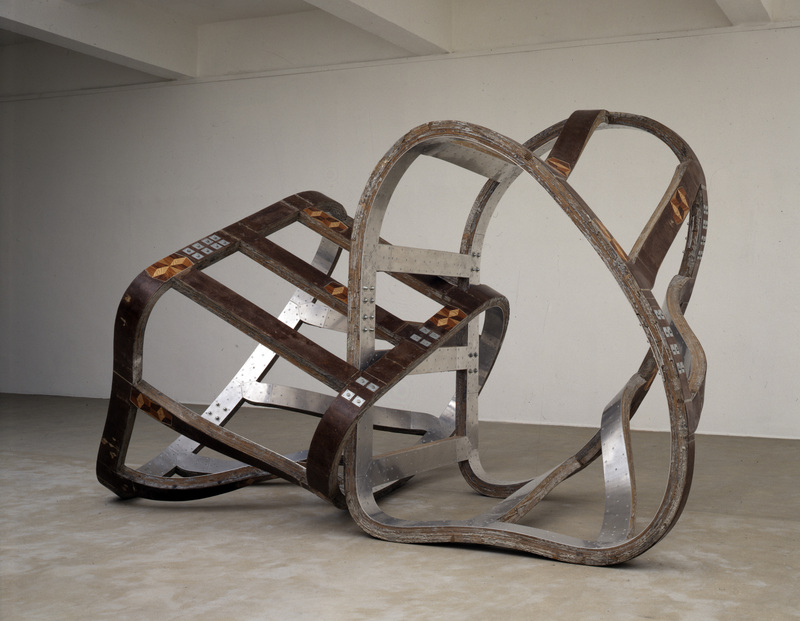 Throughout his forty plus year career, Turner prize winning artist, Richard Deacon has placed an emphasis on language as much as physical substance in his works and this stems from his interest in poetic and philosophical texts. 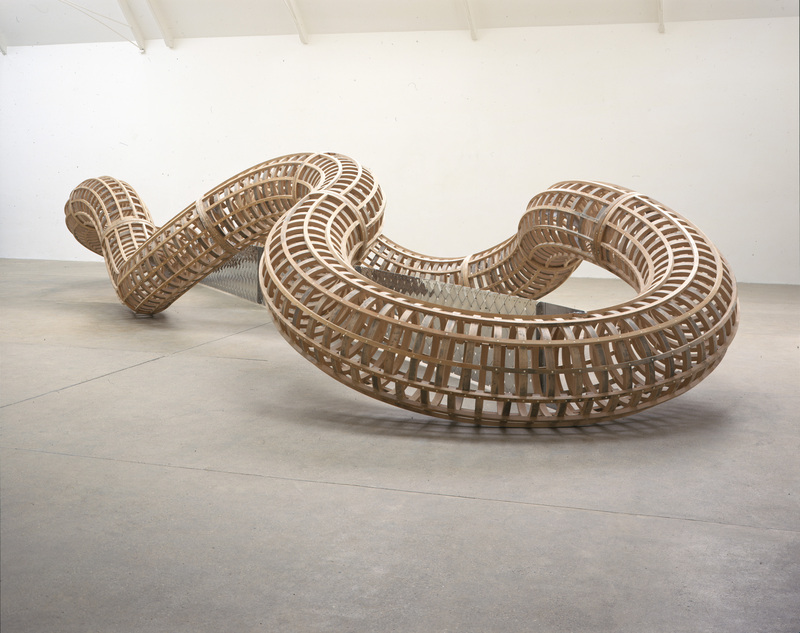 His sculptural forms are often lyrical in feeling be they made of laminated wood precisely engineered into organic, flowing curves or more solid forms such as the welded steel Struck Dumb created at Govan Shipbuilders. Visitors will find his series of early drawings It’s Orpheus When There’s Singing 1978 of interest as their curvilinear forms herald the organic shapes of his later sculptures. Not all his works are large as the series Art for Other People first started in 1982 amply shows. These were designed for domestic spaces and show the wide variety of materials Deacon uses in his work, including marble, brass, suede, leather, wood, resin, ceramics, polythene, mdf and cardboard. 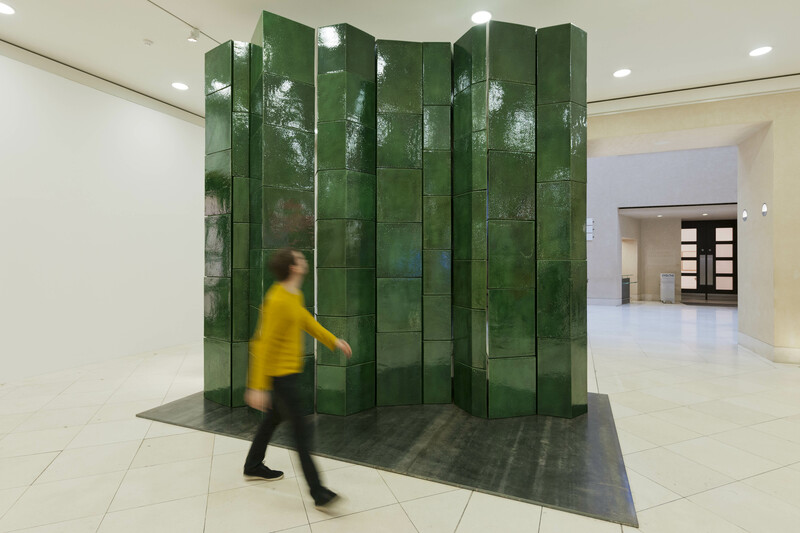 Those visitors to the Tate who use the Manton entrance will be greeted by Deacon’s Fold 2012 a 4 metres high 60-part green ceramic sculpture which weighs over 12 tonnes. This is the first time that this sculpture has been shown in a public gallery. The artist says of it ‘It’s wonderful that I have been given the opportunity to show such an ambitious work at Tate Britain. I’ve always thought of it as more of a gate than a barrier and we’ve placed it in the space between the entrance to and the exit from the exhibition, which is also in the area the public circulates. The work joins the beginning and the end with a fold in the middle. You could almost call it a hinge’. This entry was posted in Contemporary Art, Decorative Arts, Sculpture, Visual Arts and tagged 20th Century Design, arts, contemporary art, Fine art, Sculpture, Tate Britain, Visual Arts.